The kitchen is a happy place in most homes where parents make meals and enjoy idle chat with their children or guests if they are hosting. Most people spend a decent amount of time in their kitchens and when you look at home values in the Toronto market, kitchens and bathrooms can make or break sales faster than any other room in the house. We at Stone Masters like to think our kitchen countertops are ideal for tying a room together and they can take a dull kitchen and make it fabulous with only a few slabs of premium cut granite, marble or quartz. Our countertops are beautifully cut from a variety of materials that are primarily sourced from the Italian countryside and other parts of Europe for a classical and clean feel. Our Toronto location offers many different options for your kitchen countertops and some of the most popular include quartz, granite and marble. We offer many gorgeous shades for you to choose from and we are regularly adding new ones whenever they are unearthed by our international buyers in Europe. Customers can also check this website for updates or call one of our trained customer service agents for news on emerging styles, trends and colours. There are currently sixty-four different shades of granite that we offer, and twenty-three shades of marble that can be cut to various shapes and sizes depending on your needs. 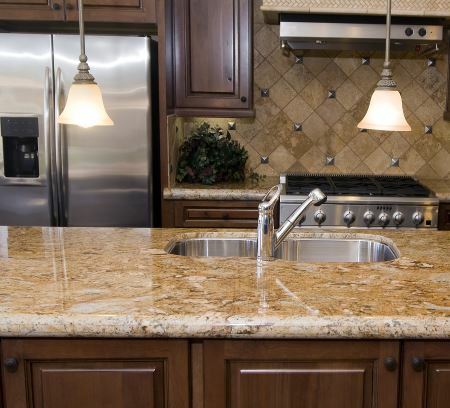 No project is too large or small for our kitchen countertop specialists, so when you are ready to upgrade, please consider Stone masters for any of your surface needs. Our newest options include quartz and these are simply spectacular. THE MOST DURABLE STONE PRODUCT CURRENTLY AVAILABLE IN THE MARKET. CURRENTLY we are offering MORE THAN 6 BRANDNAMES and you can virtually CHOOSE ANY COLOR, ANY SHADE FROM ANYONE OF THESE BRANDNAMES TO BUILT UP YOUR NEW kitchen/BATHROOM countertop. Please send us your plans and let us procure your beautiful materials. Silestone – An innovator in the engineered quartz movement, Silestone offers a constantly updating range of colours and styles and has accumulated an amazing reputation for unequaled beauty in the surface industry. In business for over 25 years, we at Stone Mastersare proud to include their products in our offering and would love the opportunity to show them off to you whenever you are ready to mak e the MOVE ON THE quartz COUNTERTOPS. Hanstone – Hanstone offers unparalleled kitchen countertop beauty with its quartz line and we at Stone Masters are proud to say we have partnered with them for the ultimately collection, which can provide a much needed clean and modern look to anykitchen no matter what the size or shape. We are committed to offering a tremendous number of options in various materials of both classic and progressive appeal, all you need to do is give us a call and we would be happy to answer any questions you have about our products, colors or shapes. We at Stone Masters understand you have many options for your kitchen countertop needs in the Toronto area, so we will DO OUR BEST to exceed your expectations if you give us a call. Stone is an excellent material for kitchen countertops, and here at Stone Masters, you will find a variety of granite, marble, and quartz countertops for your Toronto home. In most homes, the kitchen is a busy place. You’ll probably spend hours in there cooking, cleaning, washing dishes, having dinner with friends and family, and so forth. It’s in your best interest to have a countertop that can withstand a lot of abuse. 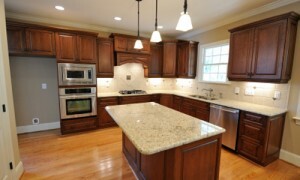 We offer a selection of countertops made of high-quality, durable materials. Nothing makes a kitchen more inviting than countertops made of quality stone. Our products are made from slabs of granite, quartz, or marble. Each of these materials is available in a variety of colours, hues, and styles. Our newest countertop material selection includes quartz. It’s essentially engineered stone, manufactured from quartz and a binding resin. It is a highly durable material and does not require sealing, unlike granite. However, if you still want a granite countertop, you’ll be glad to know that sealing is an easy process and does not have to be done very often. 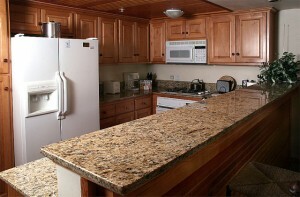 Granite is a popular option due to its natural beauty and durability. No two stones look exactly alike. It’s formed in extreme heat and is unlikely to discolour or crack from hot dishes. As a natural product, it has pores that can absorb stain and liquids. Marble offers the smooth look. Some slabs feature beautiful vein patterns. If you want to use it as a countertop, opt for a low-sheen finish that will hide the wear and tear. Marble is a very beautiful choice of a countertop, although it requires a bit of care. When cared for properly, it can last for a very long time. Looking to add a bit of colour to your kitchen? What about Blue Bahia granite? Or Rosso Monza quartz from Silestone? Marble is always a classy choice for sleek kitchens, and we offer over 20 shades of it in a broad range of hues, ranging from Crema Marfil Select to St. Laurent black. In addition to Silestone, we also offer quartz countertops from brands such as Samsung, Hanstone, and LG. The colour selection includes white, black, veined, cool hues, warm hues, textured styles, and more. Marble is available in many different colours as well. It’s not always white, cream, or gray looking. In our catalog, you will find marble in other colours, from green to brown. Toronto homeowners choose us as their countertop provider because of our knowledge, experience, friendly customer service, and high-quality materials. Our professional inspectors examine our products thoroughly before shipping them out from the source. Browse through our catalog to see all of the material and colour options. The visualizer tools might also help you find the ideal countertop for your needs. Even though stone is a natural product, and no two slabs are exactly the same, our staff will do their best to ensure that the finished product is as close in appearance as possible to the sample image. Call or email us to learn more about countertops and other kitchen products! When it comes to remodelling the kitchen in your Toronto home, most experts recommend choosing the countertop before anything else since it can have the biggest impact on the aesthetics. A lot of thought goes into the upkeep of kitchen countertops in homes in Toronto. But a large part of it is aimed towards the aesthetic part of the upkeep. Nobody likes to see smudges and stains on their gloss-finish granite countertop. Quartz has always been considered as an alternative choice to Granite. But it is no longer holding the second position. Thanks to its aesthetics and practicality, it is fast overtaking granite as the de facto choice for counter space. If you are upgrading your kitchen in Toronto to accommodate a growing family, then you must consider making it as child friendly as you can. A lot of homeowners do not give this serious thought until they realize that the expensive stone countertop is beginning to wear out a lot sooner than expected. The advantages of having a durable outdoor kitchen countertop goes beyond arranging the delicacies when you are hosting guests. It lets you enjoy the great outdoors and tremendously adds to the value of your home. To take the guesswork out of it, we have collected a list of kitchen countertop trends for 2016 that will help you immensely while planning. These trends are not voguish and it would be fair to say, that these are here to stay for the next few years. Selecting a countertop for your kitchen in Toronto is not as simple as ordering a slab of granite or buying a formica counter anymore. There are a wealth of options to choose from and before you swipe your credit card, there are a few factors that you must consider. One of the reasons why you don’t hear much about lesser priced countertop alternatives is because they are not marketed as aggressively as some of the other ones. But that does not mean in any way that they are not an apt choice for your Toronto home. Toronto residents looking to remodel their kitchen are now greeted with a lot more choices for their countertop surface. The good old Butcher block and the evergreen granite are still around. But there are new entrants into the market that most people are unaware of. Should You Install Your New Kitchen Countertop by Yourself? Which Is Better for My Kitchen Countertops: Granite or Quartz?